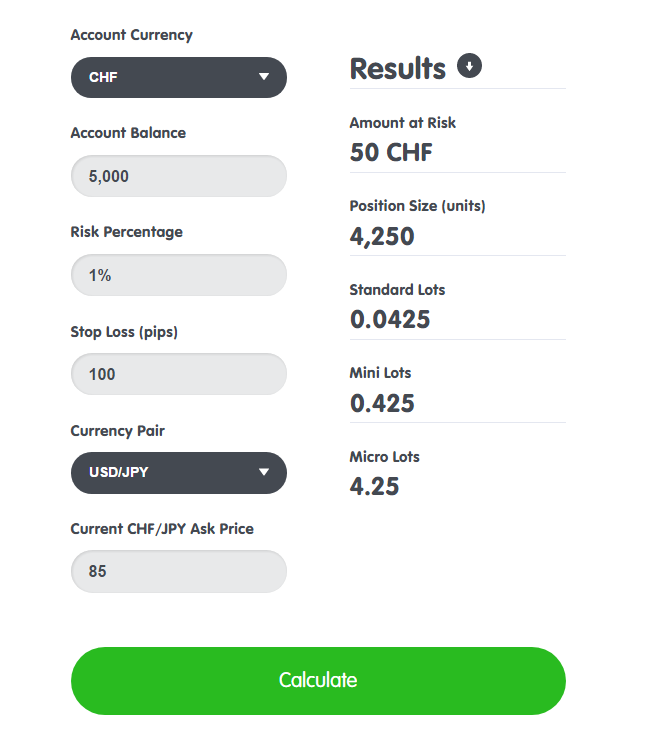 As I was reading through the examples on calculating position size in the Pipsology course, it occurred to me Ned Newbie only invests CHF 50 to make his risk of losing 100 pips of JPY not exceed CHF 50. But that just can’t be correct. The calculation assumes that by losing 100 pips, he loses CHF 50. That would mean he would lose 100% of his CHF 50 investment. What I assume has gone wrong here (and also in the previous examples which are given), is that the calculation doesn’t take into account the USD/JPY exchange rate. If you assume USD/JPY is 1 JPY, which is 100 pips for JPY, yes, then you indeed risk losing 100% of your investment with a 100-pips stop. But in that case you wouldn’t set the stop that high, might as well set no stop at all. BTW, the course is otherwise really great and I’ve already learned SO MUCH from it. What I assume has gone wrong here (and also in the previous examples which are given), is that the calculation doesn’t take into account the USD/JPY exchange rate. Let’s start by being careful with our terminology. Let’s not use the term invest, because that’s not part of speculating in forex. In the example you are questioning, the account is denominated in CHF, and the quote currency in the pair being traded is JPY. Therefore, the only currency conversion which will need to to done (mathematically, not involving actual currencies) is a conversion from JPY to CHF. The conversion from JPY to USD, which you suggested, does not enter into this example. Newbie Ned has a CHF-denominated account funded with 5,000 CHF. Ned’s trade will involve the earmarking of a certain percentage of the value of his position as margin. Neither his account balance, nor this margin amount, will figure into the position size calculation you are struggling with. And neither his account balance, nor this margin amount, can be viewed as an investment. Finally, Ned will risk no more than 1% of his account on this USD/JPY trade. That is, his risk will be limited to 50 CHF. This risk is stated in CHF, because this account is denominated in CHF, and all currency amounts (balance, equity, and P/L, etc.) are stated in CHF. But, the pair Ned is trading has JPY as its quote currency. That means that, in this trade, pips are fractions of JPY – not USD, and not CHF. Ned has determined that this trade must not go more than 100 pips against him, and that his maximum loss (his risk in this case) will be 50 CHF. Therefore, 100 pips = 50 CHF. To be specific, 100 JPY pips = 50 CHF. But, equating yen-pips to Swiss francs is like comparing apples to oranges, so Ned needs to figure out how many JPY equal 50 CHF, so that he can equate yen-pips to JPY. That’s why the CHF/JPY conversion is made in this example, and why a USD/JPY conversion does not apply. The example, as given in the School, is correct. With the metrics of this USD/JPY trade entered, the Calculator yields the same results as the School lesson. Up until 100 JPY pips = 50 CHF it seems clear. But the steps after that seem to presuppose that USD/JPY is 1 and that therefore, each individual pip change will result in a 1% change and therefore a 1% risk if the trade moves against you. That has the absurd consequence that Newbie Ned is risking 100% of his risk capital of 50 CHF, because he has decided on a 100-pip JPY stop (100 JPY pips = 50 CHF). But what if USD/JPY is 111.1 (roughly the current rate). Then 100 pips will result in 1/111.1*100% change, rougly 0.9% change. Then we would have Min(5000,50/(1/111.1)) CHF as the maximum Ned can risk. Sorry, none of that makes any sense. At no point in this calculation is a USD/JPY price presupposed. Furthermore, the USD/JPY price has no bearing on the position size calculation which this example is addressing. This example would be calculated exactly the same way, with exactly the same result, whether USD/JPY was 1.0000, or 10.000, or 100.00, or any other price. and a 1% risk (which I presume you know refers to 1% of the account balance). There is nothing in this calculation involving any percentage change in any price. There’s nothing absurd about it. The whole point of this calculation is to establish the fact that IF the price of USD/JPY moves 100 pips against Ned’s position, THEN Ned will suffer a loss of 50 CHF. Whenever you place a trade with a stop-loss, you are risking 100% of the risk capital you have assigned to this trade. What part of that do you not understand? In every case in which JPY is the quote currency, one pip = 0.01 JPY. That’s the definition of “pip”. It’s 1/100 of one JPY in yen-pairs, OR 1/10000 of the quote currency in any other pair. Let’s get back to Ned. Ned can’t understand how to calculate position sizes, so he just guesses. He’s willing to risk up to 50 CHF on this trade, but no more. He tries a position size of ONE UNIT of USD/JPY. He has a 100-pip stop loss, and sure enough, the price of USD/JPY moves 100 pips against him, and stops him out. How much did he lose in his CHF-denominated account? One pip is 0.01 JPY, so 100 pips is 1.00 JPY. Ned has lost the CHF-equivalent of 1 yen, but how much is that? Well, CHF/JPY = 114.60 (current price from above). That price can be read as: 1 CHF = 114.60 JPY. So, 1 JPY is (1/114.60) CHF. That is, 1 JPY = 0.008726 CHF. That’s how much Ned lost on this trade – less than 1/100 of 1 Swiss franc. But, Ned was willing to risk (lose) 50 CHF, if this trade ended in stop-out. So, obviously, a position size of 1 unit isn’t accomplishing Ned’s purpose. He needs a much larger position size. But, how much larger? Well, in order to ramp up his risk from 0.008726 CHF to 50 CHF, he’d have to multiply it by 50/0.008726, which is 5,730. So, Ned needs to increase his position size from 1 unit to 5,730 units, in order to match his 100-pip stop-loss to his predetermined 50 CHF risk. Bottom line: Given the current price of CHF/JPY, a position size of 5,730 units of USD/JPY, with a 100-pip stop-loss, results in risk (loss at stop-out) of 50 CHF. You can plug these numbers into the Position Size Calculator, linked to in my previous post, to confirm these results. Notice that the USD/JPY price did not figure into this calculation. Also, if you use the Position Size Calculator, you will not be asked for a USD/JPY price. It’s irrelevant. Let me explain in further detail my reasoning and why I believe USD/CHF is necessary to know in order to do the calculation. So in the example in the course, Ned wants to risk no more than 1% of his account, 50 CHF of his 5000 CHF account. I take the example in the Pipsology course to be calculating how much JPY he can use for the setup he sees on USD/JPY such that he does not lose more than 50 CHF if his stoploss gets triggered correctly and, for simplicity, without any slippage (and, also for simplicity, without any change in CHF/JPY in the meantime and without taking into account factors such as the bid-ask spread and any change in that value, etc.). The total amount that he can spend on the USD/JPY setup is what I called, perhaps incorrectly, ‘risk capital’. Obviously, after selling CHF/JPY, he’s buying USD/JPY to establish his position. Since he’s buying USD/JPY, the JPY 100-pip loss as a percentage of USD/JPY is his percentage loss in case his stoploss gets triggered. If we now take USD/JPY to be 111.1, then a 100-pip loss is a percentage loss of 1/111.1*100%. Why 1/111.1? Because 100 pips in JPY is 1 JPY and USD/JPY is presumed to be 111.1. But 1/111.1*100% (his 100-pip loss as a percentage of the amount spent) is already less than the 1% risk he’s willing to take (1/111.1 < 1/100). So deriving from this percentage and the 50 CHF he’s willing to lose the total amount he can use for this setup without any regard for his account limit would result in a value greater than what’s available for him to spend in his account. His account is only 5000 CHF, so that is the amount he can use for this setup. Therefore I inferred Min(5000,50/(1/111.1)) as the amount in CHF he can spend on this setup, for whichever is the smallest value of those two inputs is what he can spend in CHF. From this amount in CHF an amount in JPY can then be calculated with CHF/JPY. I thought you were insisting that the USD/JPY price was essential in this calculation. As long as you understand that the amount in question is the 50 CHF risked on this trade, then risk capital is as good a term as any. However, it isn’t spent. It’s actually put up as a bet. – More on that in a later post. Buying and selling does not take place in the retail forex market. Maybe this is the root of all your troubles in understanding position sizing. And the concept of buying or selling a currency pair has no meaning. Please tell me: if you actually “bought” the USD/JPY pair, what would you own? I’ll post more later on what goes on when you take a speculative position in the retail forex market. And it ain’t buying or selling. Using your calculation method, how large a position in USD/JPY should Ned take? In the Pipsology course this subject is treated early on: Know When to Buy or Sell a Currency Pair - BabyPips.com (also here: What is Forex: Buying And Selling In Currency Pairs - BabyPips.com). My answer would be 5000 CHF, because that is the maximum available in his account and will limit his risk to even less than 1%. Ok, I think I’ve found the mistake in my own reasoning. The example does not speak of 4,250 units of JPY, but of 4,250 units of USD/JPY. And it is treated incorrectly. If you want to pursue this topic, let me know. Your answer doesn’t make sense. The correct answer would be x-number of units of USD/JPY (the pair being traded). — not at “even less than 1%” ? … and 4,250 units of USD/JPY is a position with a notional value of $4,250 (the base currency). Keep working on these concepts. You can master them.